Kathmandu, 26 January: The two days training course on “empowering women to adapt climate change effects for sustainable growth” was held at the Janabhabna College in Nepal on 24-25 January 2019. The training course was orgnanised as a part of the on-going project of BASUG in collaboration with its local partner SOLVE Nepal and with the support of the German International Development Cooperation GIZ and CIM. About 40 women representatives from different cooperatives and women communities took part in the training course. 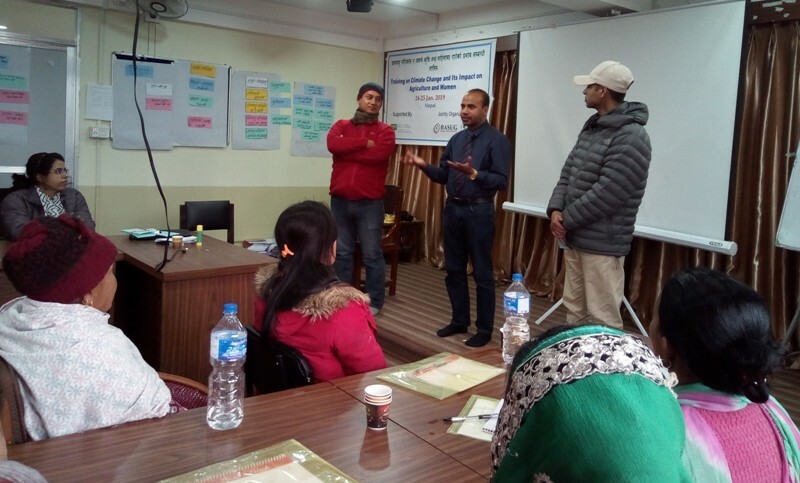 Expert on Climate Adaptation Sohan Shrestha, Social Development Officer of SOLVE Nepal Nara Maya Rana, Climate Change Consultant Engila Mishra Maharjan facilitated different sessions in the training course, while Project Coordinator from SOLVE Nepal Himal Ghimire was in the chair. Project Coordinator of BASUG Germany AHM Abdul Hai spoke in the training as guest speaker. Speakers in the training stressed on the need for pro-active role of the women communities in the climate adaptation. They added, the impact of climate changes is not limited to one area of the world. Rather it has been affecting the air, water and soil of different corners of the world in the same way. That is why German development cooperation and Europe based Diaspora organization BASUG have come ahead with the plan of women empowerment through climate adaptation. Through these training courses women beneficiaries have learnt how to grow more climate adaptive vegetables and food products through alternative ways and accomplish their own empowerment. Facilitators reflected the negative impact of climate change in different sectors – agriculture, water resource, forest and biodiversity, human health and community infrastructure. Additionally, they highlighted the dimension of reducing climate change effect as adaptation and mitigation with contextualizing local perspective. They also explained the implication of the plastic products and ingredients on the water, air and soil. They also recommended the alternative to plastic products explaining the serious hazards caused by the throwing of plastic items and waste into the nature. The training was conducted with participatory approaches following interactive discussion, audio-video documentary show, group work and illustrative power point presentation. The participants provided the overall feedback of the training with the overwhelming responses as it was very effective to gain insights on climate change sciences, its changing pattern, effects and impacts in different sector and possible ways of minimizing impacts as mitigation and adaptation. Further they have expressed the training duration has to be increased with the exposure visit and practical insights. They also recommended getting support on the simple climate adaptive technologies as improved cooking stove etc. A documentary film made by SOLVE-Nepal under the project on the climate change adaptation and women empowerment was also screened. The objective of the training course was to create awareness and to increase the skills of the unprivileged women, youth groups and local development activists on the issue of adaptation to the climate change hazards for the sustainable growth and food security in Nepal. Another training course for the women beneficiaries will be held in Lalitpur and Kathmandu this year to find out the results and changes after the first phase of the training courses among the women beneficiaries. Under this project an advocacy workshop will be organized in Berlin, Germany in April 2019.